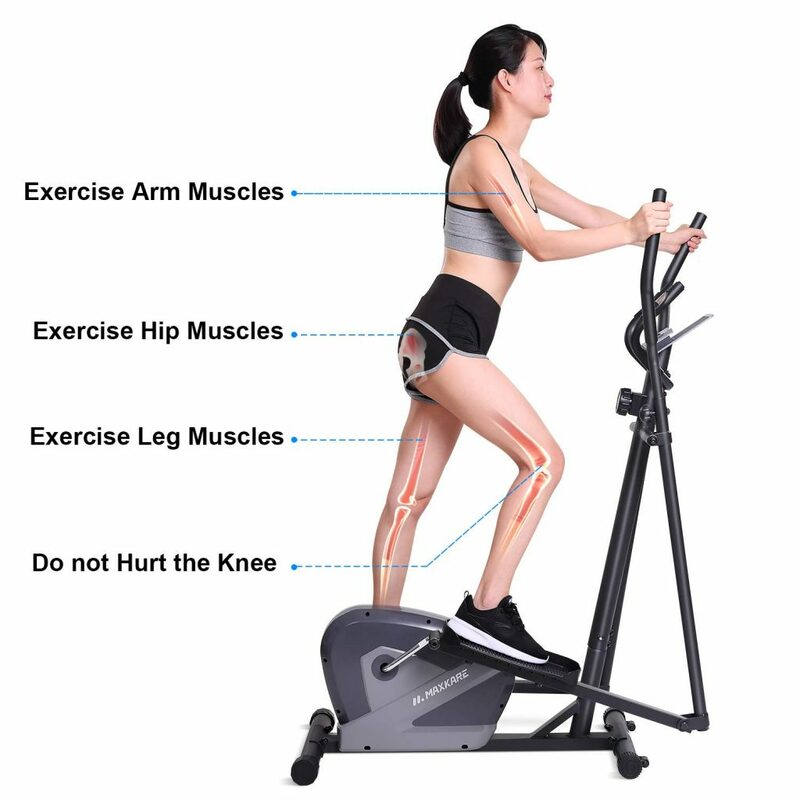 MaxKare Elliptical Trainer is a portable upright bike and elliptical with the magnetron resistance system for an efficient cardiovascular workout in the comfort of your home. You and people in your house can use it every day to burn calories, lose weight, get in shape and tone muscles of your lower and upper body and abdominals. MaxKare Elliptical has eight levels of magnetic resistance to give you different levels of workout challenge that you can benefit from for faster calorie burning. It runs smoothly and quietly at all times, even during your strenuous workouts. 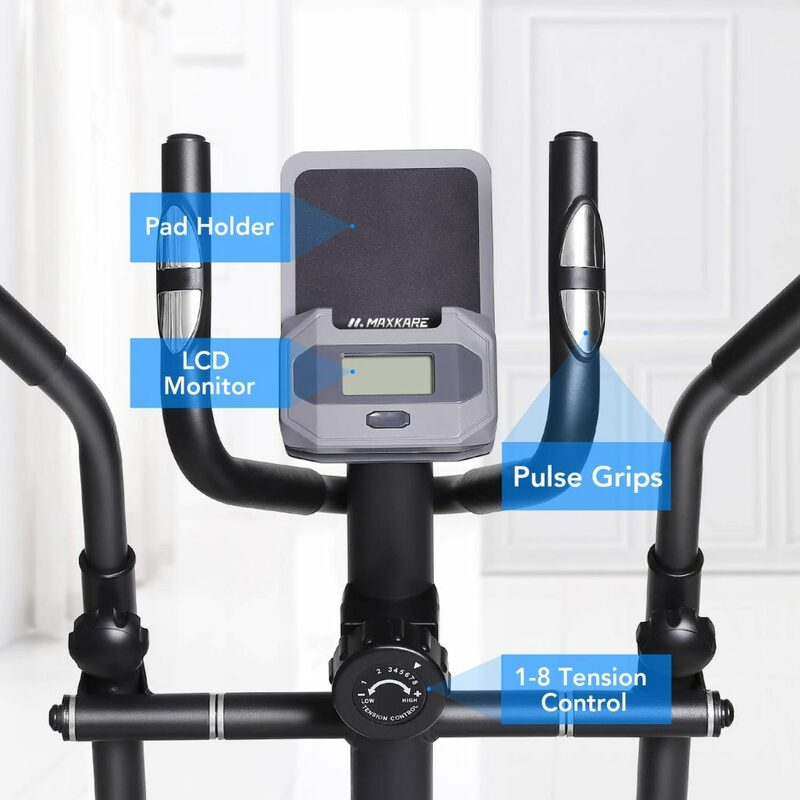 Please note that this elliptical bike is designed for home or office use and not for commercial gym settings where tens of different people use the fitness machines every day. You’ll get a lower impact workout than treadmills or bikes and you won’t be likely to hurt your knees or joints on its large anti-slip foot platforms with decent support. There is a simple LCD display panel that is easy to read and operate, along with a tablet holder at the top. The standards indicators you’ll find on the LCD display panel are time, distance, speed, calories burned and heart rate. You can see your heart rate on the display and stay in your target heart rate zone and burn calories. The pulse sensors are located on the fixed handles on both sides of the display. We recommend that you change the level of resistance via the tension knob in the middle between easy and difficult during your workout to burn more fat. It is a relatively compact elliptical trainer that can also be easily used in small spaces. This is great for those that live in smaller apartments. The MaxKare Elliptical Trainer is a portable fitness unit despite having a heavy duty frame and overall sturdy construction. You can move it anywhere easily by pushing gently on the transport wheels within your house or exercise outdoors in your backyard. It is a low decibel machine and you shall not be disturbing your neighbors or people sleeping in your house. You can also listen to songs or watch a show on TV or on your tablet and go for longer. The foot pedals offer decent grip and you can certainly feel safe and stable during the hardest workouts. MaxKare Elliptical is offered with a good customer support that you can contact in case of any problems and they will try and help solve it for you. It is portable, quiet, smooth, safe, stable, works your whole body, helps burn calories and get results quicker and has an affordable price tag. It is great value for money overall and well worth considering. We do not hesitate to recommend it.